Summer's the time for weekend excursions, road trips and beach chilling. But for those of us who don't have a three-month-long summer break (sadly, we can't all become teachers), a little impromptu getaway of sorts is a necessity post work week. Today, American Express is coming with the perfect way to kick off your weekend. 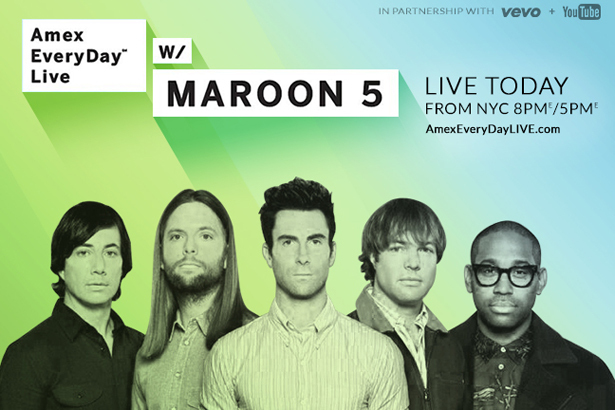 To celebrate the launch of its new Amex EveryDay Credit Card, this evening they will be streaming the Maroon 5 concert live from the Bowery Ballroom in New York City, starting at 8 p.m. ET. So if you're planning on hitting the town, you can get ready to the sounds of Adam Levine and the gang from the comfort of your own home. No crowds, no overzealous fans spilling beer all over your new blouse–just good ol' fashioned tunes for a sweet weekend mini-getaway. American Express launched the Amex EveryDay Credit Card in April with the help of funny lady Tina Fey. The EveryDay rewards card awards points for members based on how much they use their card–not how much they spend. Use your card more than 20 times in one billing cycle, and you get 20% Membership Reward Points on those purchases. American Express also launched a contest in which contestants would post their #EveryDayMoments with selfies for a chance to win an Epic EveryDay Getaway to New York City. The 50 (plus one guest for each) winners have already been announced, and have been twirling around NYC since Wednesday, staying at the InterContinental Times Square, where a jam-packed swag bag was waiting for them. A few of the goodies inside? An American Express Gift Card, DVD of Disney’s Frozen, Cameron Diaz’s The Body Book, LeSportsac cosmetic bags, Yosi Samra Shoes, RoC Multi Correxion Eye Cream, Sephora Makeup Remover, DryBar Dry Shampoo, movie tickets and more. The Epic EveryDay Getaway kicked off yesterday with a visit to the TODAY show, a cocktail party with Real Housewives of New York star Kristen Taekman, who showed the gang around town before hitting up a Broadway performance of Rock of Ages. This morning, winners got an early start on the day with an 8 a.m. SoulCycle session in Grand Central Station with Kristen Bell and instructor Stacey Griffith. After, they headed over to Milk Studios to have a makeover session with Rent the Runway, Drybar and Sephora. Guests were treated to blowouts and style tips from expert Rachel Zalis, while nibbling on goodies courtesy of eipcurious.com. The epic getaway concludes with tonight's Maroon 5 concert at Bowery Ballroom. This exclusive Maroon 5 concert is one way that American Express is rewarding multi-taskers, by bringing one of the hottest bands to fans tuning in at home from around the country. Sounds like a great experience, right? But if you didn't win, this Maroon 5 live stream is a great consolation prize. Be sure to tune in at 8 p.m. EST (5 p.m. PST) for this evening's show, and rock out with the American Express Epic EveryDay Getaway. Click on the image above to view the live stream and share your thoughts about the show with the hashtag #AmexEveryDayLive.